Why Acuvue Moist contact lenses may be the most comfortable lenses for you and where you can buy them at a great price online. Daily disposable lenses are the ultimate in convenience and luxury; after all, wouldn't everyone like to be able to pop in a new pair of lenses every single day for absolute comfort? Oh and not forgetting hassle-free cleaning and disinfecting - there isn't any! The only problem I have with these wonderfully comfortable daily lenses is the price; they cost around 50% more per day than 1 week disposable contacts. But I still buy a couple of boxes each time I place my regular contact lens order, as they are so useful for overnight travelling or when I'm going waterskiing - it's cheaper to lose a daily disposable lens in the water than a 1 week lens! 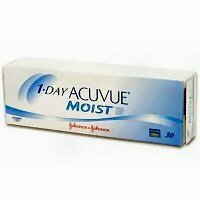 Acuvue Moist contact lenses are a daily disposable contact lens manufactured by Johnson & Johnson. These disposable contacts block up to 82% UV-A and 97% UV-B rays and have the highest UV protection available in a daily disposable contact lens. Acuvue Moist Contact lenses are designed to help eyes stay moist and fresh even at the end of the day. Simply pop in a fresh pair every day for maximum comfort and convenience. The contacts use LACREON technology which forms a cushion of moisture similar to your natural tears, reducing friction and maintaining hydration. If you suffer from allergies and frequent itchy eyes, Acuvue Moist may offer "improved comfort," the manufacturer's claim which has recently been approved by the FDA. So if, like me, you suffer from dry itchy eyes, especially in the summer months when there's lots of humidity and dust in the air, Acuvue Moist daily disposables could be the most comfortable contact lenses for you. I can certainly vouch for the fact that they are silky smooth and feel like you're not wearing any lenses at all - they are very thin, however, so it's easy to tear them if you're a bit ham-fisted! I have a couple of boxes of these lenses in my bathroom cabinet and it's so easy to buy daily disposable contact lenses like Acuvue Moist online. Just visit a reputable contact lens retailer with guaranteed low prices like AC Lens and place your order. The price is lower the more you buy, for instance it currently costs $20.95 for 6 boxes of 30 lenses and $18.87 for 12 boxes. But if you haven't tried Acuvue Moist contact lenses before, you may want to order just one box with your usual contact lenses first. I usually order two or three boxes of daily disposables when I buy my 1-2 week Acuvue Advance lenses, using the ultra comfortable daily disposable Moist contacts when my eyes are especially itchy, or if I'm going away for a few days and want the convenience of not having to worry about taking bottles of contact lens solution on my travels. Tip: Take advantage of additional discounts by using one of these coupon codes from AC Lens.